You will enjoy old-fashioned goodness in every bite of this wonderful cake! 1. In a large mixer bowl, beat the sugar and butter until creamy. Add applesauce and egg; blend well. 2. In a separate bowl, combine the flour, cinnamon, nutmeg, cloves, baking soda and salt; add to applesauce mixture and beat until well blended. Stir in the raisins and nuts, if using. 3. Pour into a well-greased 10 cup bundt pan; bake at 350 degrees F. for 50 to 60 minutes. 4. Combine all the glaze ingredients until smooth; drizzle over cooled cake. Makes 12 servings. 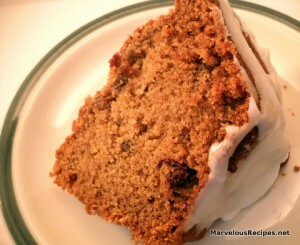 I love a good spice cake and this sounds good! I am stopping by to wish you and yours a happy Thanksgiving.